One brand of coffee maker I like is the one I got from Starbucks store. It is the Delonghi coffee maker with a thermal carafe. First of all, the coffee it produces is really top quality. 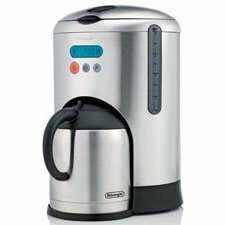 The machine that looks like a modern piece of coffee maker because it is all silver does not sacrifice the way it makes coffee. The instructions are really easy to follow too and the overall use of the machine is really easy. Even my daughter makes us coffee during the weekends and she does not have any trouble operation it. I think this is one of the best coffee makers around.